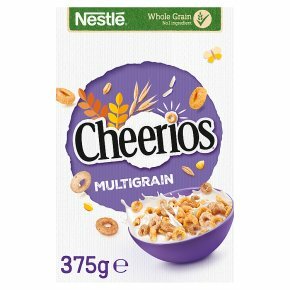 NESTLE CHEERIOS MULTIGRAIN is a fun and wholesome breakfast cereal for the whole family. Deliciously crunchy whole grains in every little O. Contains 7 vitamins, iron, and calcium which is needed for the maintenance of normal bones as part of a healthy diet and lifestyle. No artificial colours or flavours. Made with 78% wholegrain from 5 grains: oats, wheat, rice, corn & barley. High in fibre.Promotional packs are subject to availability, while stocks last. We cannot guarantee that your delivered pack will carry a featured promotion. It's the little things that count when it comes to happier and healthier families, and the delicious taste of NESTLE MULTIGRAIN CHEERIOS breakfast cereal is what everyone in the family loves to eat. Each irresistible crunchy little O is made with 5 whole grains: oats, wheat, rice, corn and barley. Fortified with 9 vitamins and minerals including calcium which is needed for the maintenance of normal bones as part of a healthy diet and lifestyle. Contains no artificial colours or flavours, and high in fibre too! When you need a wholesome and tasty breakfast cereal for your family, choose CHEERIOS - the little things that count! Enjoy a bowl of tasty wholegrain CHEERIOS with cold or hot milk.